The Voice of Australia is a page that describes itself as “against animal cruelty – particularly Halal Ritual Slaughter & the Islamisation of Australia”. It’s grown by 1% to 26,343 likes over the last three weeks. 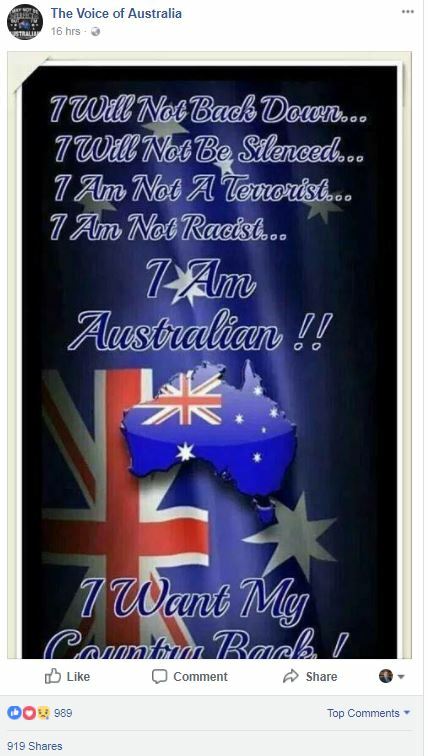 The page has been posting defensive messages attacking the idea it is related to racism or terrorism, while at the same time promoting the message that the Australian way of life is under threat. 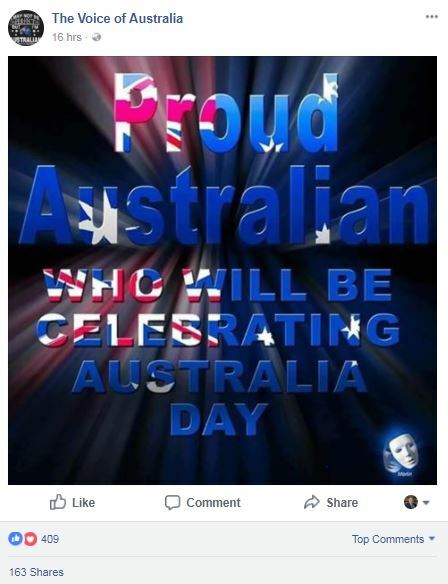 The posts for Australia day have already started and are getting traction. The page is also picking on African Youth crime as a theme. 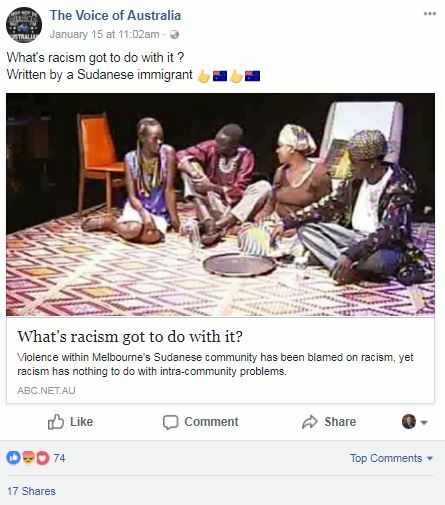 On January 15th the page posted an opinion article by a Sudanese refugee titled “What’s racism got to do with it”. 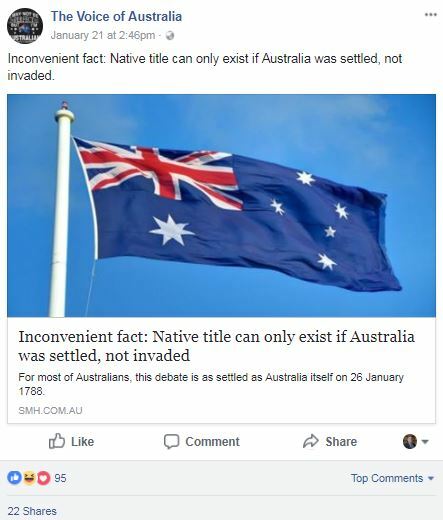 The page repeated the title as a comment. The article argues for personal responsibility and dismisses the idea put forward by an academic that a lack of support by the Australian government for the Sudanese community, or racism against them, is a factor in the violence. In the context of later posts the article appears to be posted to give a green light to racism against the Sudanese community – which is not the article’s point at all. 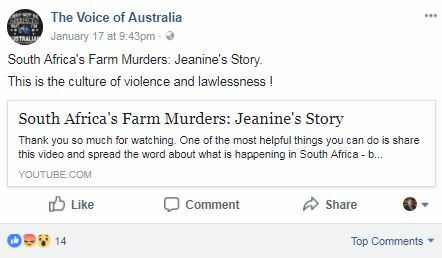 On the 17th the page posted a video about the murder of white farmers in South Africa. This is part of a general narrative promoting the idea that black Africans are inherently violent. This is similar to the way the narrative promoting Muslims as violent was spread in recent years, with examples from overseas of specific events used to pain a generalized negative stereotype. 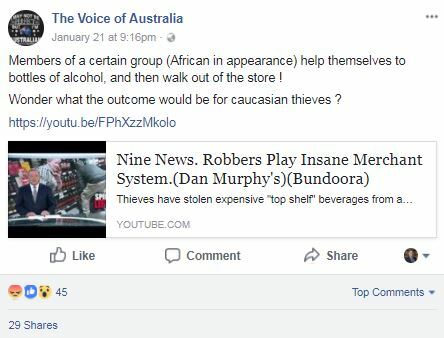 Building on this narrative and trying to make it local, a post on January 21 the page claimed African youth were responsible for a robbery of a liquor store. 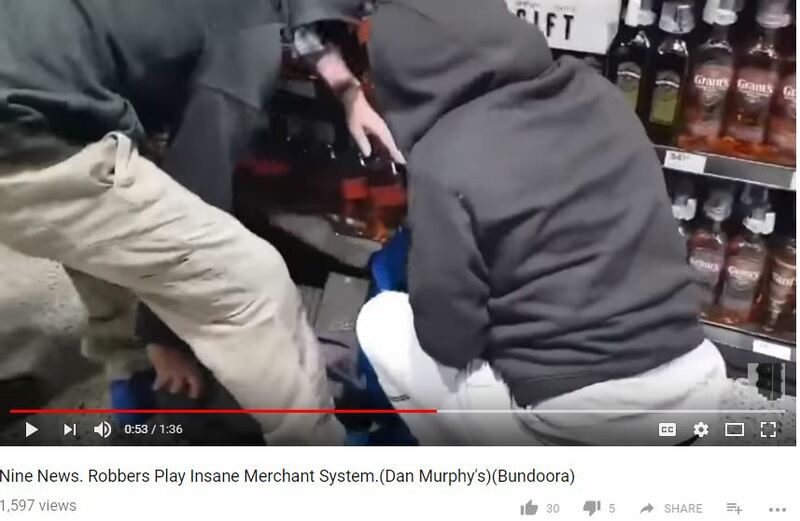 In this case, while the crime certainly took place, the targeting of African youth as the group behind the crime appears to be entirely made up by the page. 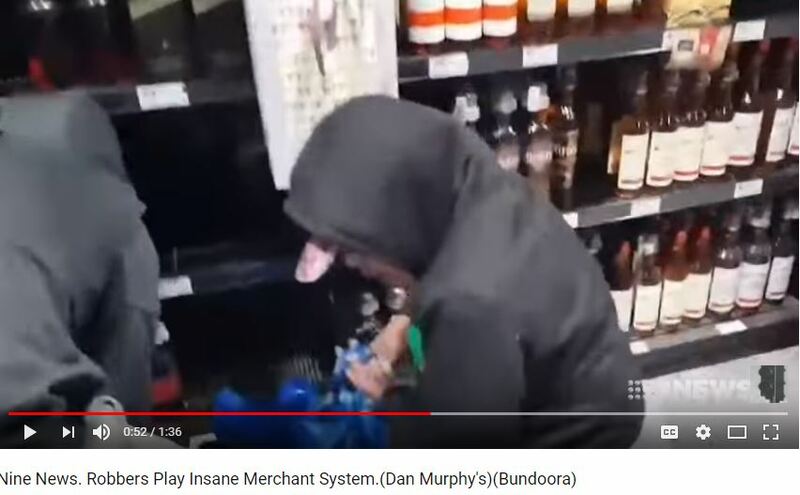 In the linked news video at 52 seconds in one of the perpetrators can be seen side on with both their face and a hand visible while the second perpetrator’s hand can be seen a second later. 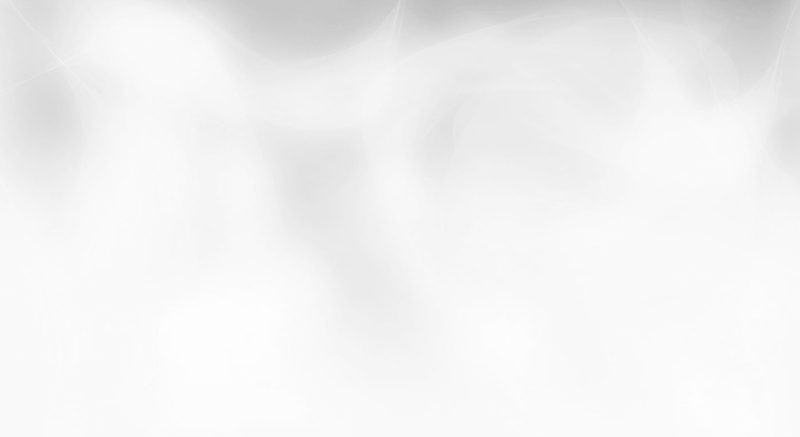 Both appears to be white. There is no suggestion in the news reporting of the pair being African in appearance. 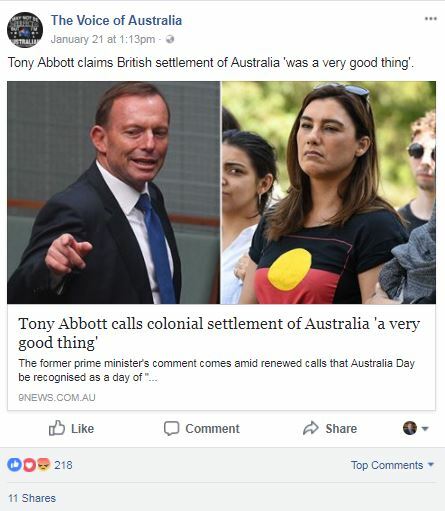 The page is also focused on defending Australia day from the concerns expressed by Indigenous Australians about Australia Day. 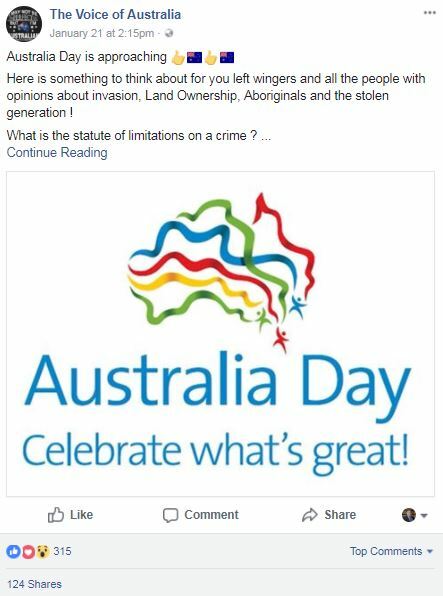 While currently relatively tame, there is a risk of pages like this posting content promoting racism against Indigenous Australians on Australia Day, or posting content that attracts comments which incite hate or violence and are not appropriately moderated by the page. You may also want to read our previous briefing on “The Far-Right on African Youth“. As a registered Australian charity our work is supported by public donations, help us continue our important work in 2018. To see more of our work as it happens, follow us on Twitter @OnlineHate and via the Online Hate Prevention Institute Facebook page.